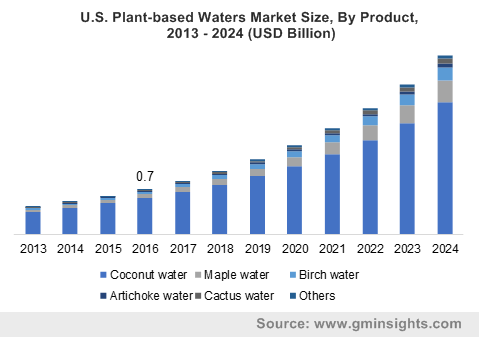 Plant-based waters market size was more than USD 2.5 billion in 2016 and is envisaged to witness phenomenal growth of more than 19 % between 2017-2024. Plant-based waters are the alternatives to the routine beverages and can provide high amount of nutrition. Many of the plant waters remain a lower-sugar, sustainable alternative to routine beverages. These provide trace amounts of nutrition, but like other beverages, it is considered to limit the intake due to their sugar levels. People have become more conscious of their health and are heading towards a healthy lifestyle. The creative packaging has a magnetic effect in increasing the sales of the product. The low-calorie content present in the plant-based waters will boost the global market. Lately, people have been scrutinizing the ingredients present in a diverse range of edible products, which allow them to make informed decisions. Earlier, the sap from the trees was collected by the hole in the tree and bucket. But now, the companies are developing automated solutions that collects sap aseptically from the tree. Beverage companies are opting for contract manufacturing for sourcing sap from trees. On the other hand, sustainability challenges and lack of documented health claims might obstruct the growth of plant-based waters. Sourcing of birch sap is quite an arduous task as this is extracted just for a fortnight in the full year. Supply chains of plant-based waters are more complex as compared to that of carbonated beverages, which can hamper the growth of the product market. The product market of plant-based waters consists mainly of coconut, maple, birch, artichoke, cactus, etc. Coconut water is one of the biggest market in terms of volume and revenue. Birch and maple water are the new entrants and are being recognized as the next "super drinks" set to replace coconut water and is heading towards U.S., U.K. and other markets. Earlier, birch water extraction was considered as a cottage industry and was harvested from trees during spring in Eastern Europe, Korea, Japan and Scandivian countries. Other plant waters such as rose, bamboo, olive, ginger, barley constitute minimal share of the total market and are expected to reach twofold of the current market size by 2024. The plant-based water market in terms of flavor type is segmented as flavored and original/ natural. Plant-based waters occurrence is natural in nature and is mostly available as flavored and non-flavored. Unflavored plant-based waters dominate the market in terms of flavor type. This segment has a significant market share as of 2016, and this trend is expected to continue during the forecast period. However, companies are introducing these waters with assorted flavors such as lime, green tea, ginger, rose, etc. Blend of two or more constituents form flavored plant-based waters. The trend of different flavors is on the rise which can significantly impact the global market. Innovations in packaging type are aiding in extending the shelf life of these products and allow manufacturers to launch healthy, low-calorie and natural plant waters that are sustainably sourced. The product market has been segmented into cans, bottles, cartons and pouches. Cartons constituted the major chunk of the market in 2016 with a revenue of about 1.1 billion which is expected to grow at a remarkable pace. Majority of the coconut water is packed in aseptic cartons. Pouches are anticipated to grow at a noticeable rate by the year 2024. The key distribution channels for plant-based waters are online platforms, retail stores and fitness centers & cafes. Online channels play a significant role in marketing of the product and hold a major market share. The ease of availability of the product and hectic lifestyle of people has led to the popularity of online stores. Through online portals, companies have the advantage of showcasing their diverse product portfolio in one platform. The retail stores accounted for the next highest share in the global market and are expected to boom with the highest CAGR of about 23 %. These stores have continuously evolved and will continue to increase in number owing to the broad portfolio of the product. Asia-Pacific provides tremendous opportunities in the future for the players as branded and packaged coconut water consumption is an untapped market in countries such as India, Indonesia etc. due to abundant supply of coconut in these countries and is unorganized and non-branded category. North America provides better potential for organic sourcing and natural flavors. In the U.S., packaged water consumption has increased over a period. Germany, U.K., France, etc. offer the best prospects for birch water as the birch trees are widely tapped in Europe. Maple water production is found in North America owing to the large-scale cultivation of maple trees. Majority of the players in the plant-based waters market are located at the domestic level and are these are Caliwater LLC, PepsiCo Inc., DRINKmaple, Happy Tree Group, Sibberi, Steaz, Harmless Harvest, The Coca-Cola Company, World Waters, LLC, ARTY Water Company, DrinkSEVA, All Market Inc., Oviva Maple Water Company, etc. Multi-nationals are eyeing to enter the developing countries as there exists untapped potential for different product categories. For instance, Coke in India is marketing Zico, a U.S. coconut water brand. The company’s brands are experiencing overwhelming reception to the brand and loyalty to the product. Companies are inking distribution deals with sellers such as Amazon stores etc. The beverage industry has captured the global market with the innovative flavors of the product. The companies are constantly upgrading technology for the extraction of a variety of plant-based waters. There has been a drift from sugary, carbonated drinks to healthy plant waters. The product is a viable alternative to soda drinks and is suitable for recreational athletes. Some of the common varieties available are coconut water, maple water, artichoke water and birch water. Other emerging counterparts include bamboo water, olive water, ginger water, etc.